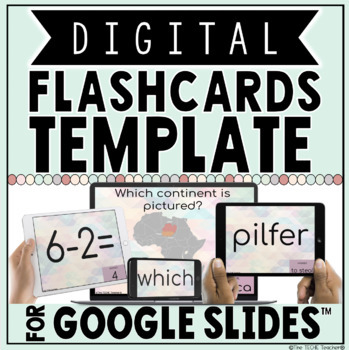 This resource is an editable template for creating digital flashcards in Google Slides™. Just plug in your information and GO. All answer boxes are already animated to appear on click when the presentation is launched in presentation mode for self-checking purposes. 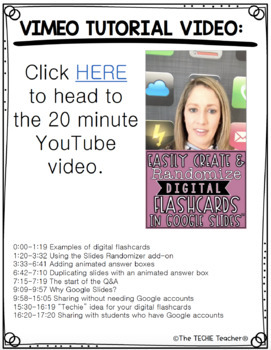 On Saturday, February 2nd, 2019 I did a tutorial on my Instagram and Facebook Stories about how teachers & students can create AND randomize digital flashcards in Google Drive™ using Google Slides™. I had several requests to post the colorful template I was using to my TpT Store so here it is! You can view that tutorial as well as a Q&A I did a few days later by clicking HERE (I exported all of the videos into one big video and imported it into Vimeo. It is a little choppy since Instastories divides videos into 15 second stories but transferred nicely for the most part). Using the add-on, Slides Randomizer, teachers & students can easily shuffle their slide deck to provide a different review experience each time the presentation is launched. 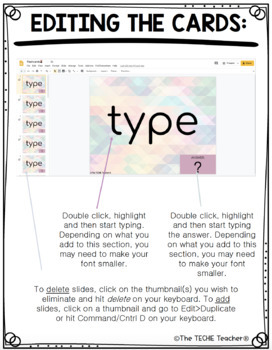 What is NOT included: Typed out directions for how to distribute/share these flashcards. However, I discuss and demonstrate all kinds of sharing options in the video. These slides are set to be 8.5x11 and can be printed. You could even share this template with students for them to plug in their own information and start practicing. They could create flashcards for another class! Students could also collaborate on the same set of flashcards with one another and work together to create a study tool. 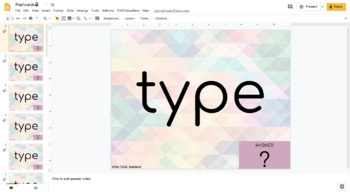 Use digital flashcards in Google Slides™ on Chromebooks, laptops/computers, iPads, tablets, phones and more! See video for more details.